The booster club is a federally recognized non-profit organization that raises money to help alleviate the cost of competitive gymnastics for Diamondback Gymnastics team members. Our responsibilities include but are not limited to: various fundraisers which include orchestrating the “Flyin’ High” Meet in the spring, ordering all team gear, and collecting team meet fees to register gymnasts for meets. Men’s compulsory levels 4-7 competitive season is defined as September 1 – August 31, our team typically competes from December – April. Levels 4 – 6 provide basic routines for all boys who desire to participate in competitive gymnastics. These exercises start with simple basic skills experienced in Levels 1 through 3 and progress developmentally with each competitive level. The compulsory level, Level 7, is designed to encourage and prepare the gymnast for the transition from compulsory to optional routines. Women’s Xcel is designed to offer a broad-based, affordable competitive experience outside the traditional Jr. Olympic Program to attract and retain a diverse group of athletes. Coaches determine the level of competition and training. Season is the same as the compulsory Level 3 – Level 5. Women’s compulsory levels 3-5 competes the same pre-choreographed routines for each level across the United States for vault, bars, beam and floor. A Jr. Olympic COMPETITIVE YEAR is defined as the period from August 1 through July 31. A COMPETITIVE SEASON is defined as that period from the first designated qualifying competition through the culminating Championships at each level. Our team usually competes in the fall (August – December) and in the Spring (January – March). Women’s optional levels 6-10 compete in the spring (January – March). These gymnasts have specific skills which are required by USAG to be included in their uniquely choreographed routines, but are also allotted “options” to highlight their strengths on each event. Levels 7, 8 and 9 have difficulty restrictions, while Level 10 has no restrictions in the skill choice. Composition is evaluated at all Optional Levels, except Levels 6 & 7. Please note: the above competition costs are estimated and are usually due by the end of July. All Diamondback Gymnastics team members are expected to compete a full season. Gymnasts will automatically be registered for meets unless the registrar is given advanced 45 day notice of non-competes due to injury, serious illness, or other extenuating circumstances. Coaches’ fees are $25 per meet and are charged to each gymnast’s account whether or not they compete at a scheduled meet. Refunds by host gyms are not usually given for meet registrations but our registrars try their best to get a refund. Who do I go to if I have questions? Each level has a team liaison that will be your first and preferred contact when you have any questions. Your liaison will communicate with the board if they receive any questions that they can’t answer. You are also welcome to contact any of the board members directly (full list on last page). · Keep track of your gymnast account through www.troopwebhost.org/evgbc/ and update your contact/ personal information (you will receive your User ID and password from the secretary). 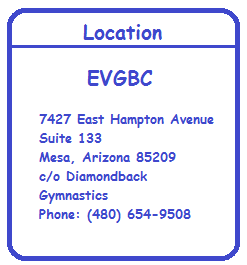 · Join the Facebook group for Diamondback Gymnastics and closed/private East Valley Gymnastics Booster Club Facebook page. · Help as much as possible- All the board members are volunteers and like you are full time parents, have full time jobs etc. If there were not a booster club in place to register the team for meets and order team gear, the gym would hire someone to do those things and that expense would increase our monthly payments. 1. There are a lot of Crazy Gym Parents (CGP) out there...do NOT fall into their trap! Be there to support your kids...be there to support your kids' teammates. Gymnastics is one of the few sports that you win as a team and an individual. The better each gymnast does, the better the team does. Please encourage good sportsmanship and cheer for all gymnasts. Do NOT bad mouth another team, coach or judge. The gymnastics world is a small and everyone knows everyone. 2. You need to be at the meet 15 minutes prior to the start of the check in time and ALWAYS plan extra time for travelling (GPS does not always give you the fastest way). 3. Make sure you have the phone number of someone on your child's team's level. It is helpful if you get stuck in traffic or lost. Keeps the panic mode away for everyone! a. Girls should arrive at meet in Warm Ups, wearing Competition Leo, hair in a high tight bun. NO fingernail or toe Polish, No jewelry, No excessive makeup, No temporary tattoos. We will have a hair clinic as the season gets closer. c. We have several styles of adult shirts for anyone else who wants to show their Diamondback pride. 6. Pack healthy, mess free, high energy snacks and water or color-less Gatorade for gymnasts in their bags (for spectators, concessions very rarely has anything healthy). 7. Once the meet schedule is published you should leave that weekend/day open for just Gymnastics. The registrar will publish the session times as soon as she has them, but they can often change. To stay informed make sure that EVGBC has your email, that you are a member of our Facebook group and keep your liaison’s phone number handy. 8. Meets are LONG!! Boy’s meets can go upward of 6 hours. Girls at levels 3-5 are heavily attended and may be 4-5 hours long. Be prepared. The seats may not be comfortable. Bring a stadium cushion. There is a lot of waiting in between events that tests the patience of many younger siblings. 9. Boy’s competition format is different than the girls. You will sit there, bored, for two hours while they warm up every event before they even start to compete. Then, they will move with lightning speed from event to event and it will be over before you know it. Be prepared with your cameras when the competing starts. 10. Take lots of photos and videos just make sure that your flash is OFF!! You do not want to be the one that causes a child to get hurt doing a skill because they were blinded by your flash or be asked to leave the event. 11. If you child needs special equipment (beam shoes, grips, braces, tape, gauze, sticky buns, etc) talk to your coach and get the specifics BEFORE you order. Not all equipment is made with the same quality and some items have competition restrictions. Your coaches can help you with the best match for your child. 13. All the board members are volunteers. Please be kind and helpful. This is a Team Sport, including parents. If everyone shares in the work and effort then everyone can enjoy their time with their Gymnast and family more.